Finding a watch that both fits your quality requirements and your budget may sound difficult and expensive at first, but it doesn’t have to be that way. Mainly thanks to the fierce competition on the market and the globalization, you can now find your perfect watch while being on a pretty tight budget. Companies like Seiko offer an impressive number of dive watches in the $150-$350 range, forcing competitors to do the same. That may be problematic for a company, but for the buyer that’s an incredible opportunity to make an awesome purchase. There are a handful of great manufacturers out there that offer lots of quality dive watches around $300. While brands like Rolex, Hublot, etc. won’t make our list, you will certainly find a high-quality dive watch at a good price, that might fit your needs. It’s just a matter of taste and whether you prefer some brand over another. It’s up to you to decide which one is the best dive watch around $300 for you. With an income of $2.72 billion per year and a number of almost 19.000 employees, Citizen is one of the biggest watch producers in the world. Back in 1924, Citizen produced their first watch, the “CITIZEN”. The mayor of Tokyo at that time named it “CITIZEN” hoping that the watch (a luxury item in those times) would become affordable for the average citizen. This Citizen Professional Diver watch is nicknamed Ecozilla for its rugged bulkiness, and also for incorporating Citizen’s Eco-Drive technology that powers the watch under any light condition. A peculiar feature of the Ecozilla is the unusual positioning of the screw-down crown on the left side, to not interfere with the various tools used by the professional divers, and also to not dig into their hand. 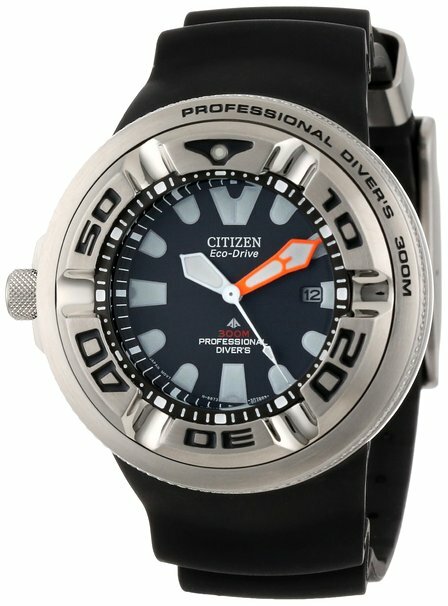 Given its already proverbial toughness and reliable features, the Citizen Pro Diver is a deal maker at the price. In a nutshell, the watch has a 300 meter (1000 feet) water resistance, a 48 mm stainless steel case with a mineral dial window, a Japanese quartz movement with analog display, a self-fueled Eco-Drive technology (that means no battery is required), a rubber band with buckle closure, a rotating bezel, and large luminous hands and hour markers. Worth mentioning for a dive watch is the luminosity of the hands and markers, and the Ecozilla really “shines” here. Apart from sporting big indexes, the watch also has a great ability to remain visible for long periods of time. That means big periods of time without being in sunlight or other light won’t create any inconvenience. The 48mm stainless steel case feels incredibly sturdy on the hand, giving it a premium feel and look along with the mineral dial window, which makes the watch shock and shatter resistant. The mineral dial window is a kind of hardened plastic that although it’s not as scratch resistant as a sapphire crystal one, it is more shatter resistant and that’s actually the most important feature on a divers watch. As for the movement, Citizen decided to keep it sweet and simple, using a precise Japanese quartz movement. Due to this, accuracy is not something to worry about. Although Citizen decided to keep this watch simple and concentrate on the most important features for a dive watch like luminosity, shock resistance etc., the bezel is not something they can boast with, with only 60 seconds per 360 degrees rotation, and a fairly cheap feel, putting it somehow in contrast with the tank-like construction of the case. If you don’t consider the 60-second bezel a drawback, overall the Citizen Pro Diver watch comes across as a great deal and a big favorite for the best dive watch around $300. If you’re looking for a more sporty Citizen diver, have a look at the popular “Scuba Fin” series, more sports-like because of the colorful polyurethane bands, compared to the more professional feel of the Ecozilla. If however you’re looking for a dive watch with more functions, such as depth meter and chronograph, Citizen has got the pricier but very reliable Promaster Aqualand BJ2115-07E. Check it out! If a 200-300 meter (700-1000 feet) water resistance doesn’t impress you, how about a 500 meter one? The Victorinox Dive Master 500 comes with this whopping water resistance, that will allow you to dive at saturation depths. The first thing that comes to mind when thinking of the Swiss multifunction knife is the red cross and the shield, that became one of the emblems of Swiss excellence and perfection. Founded in 1884, and best known for their awesome Swiss army knives, the Victorinox company also makes some of the toughest watches in the world. Needless to say, as high-depth water resistance is a must on a divers watch, so is a high contrast between the hands and indexes against the dial. 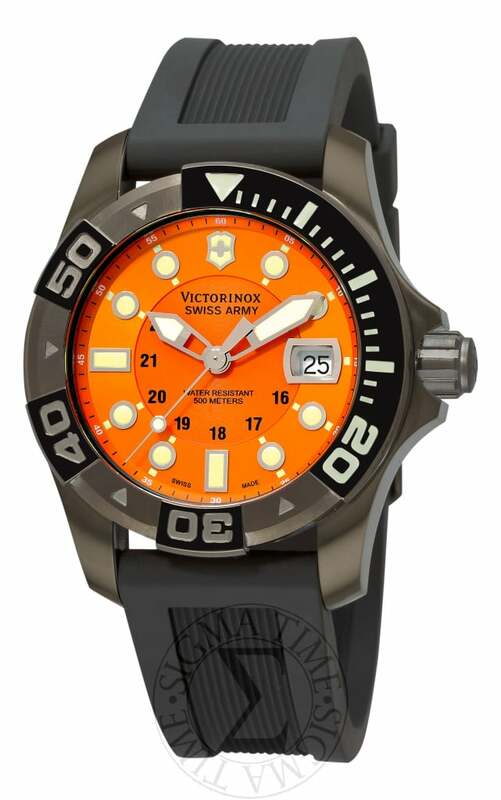 And Victorinox nailed it, the wide hour and minute hands against the orange background makes it very easy to read the time at a glance, and under most conditions (yeah, even at 500 meters deep!). The quartz movement is as precise as you would expect, the inconsistencies being insignificant, as opposed to an automatic, which is a less precise mechanism by its very nature. While robustness and light weight are not features that easily make their way together in the same watch, the Dive Master 500 Orange Dial Watch is a masterpiece in this area, weighing in at 4.7 ounces (consider this on the light side for a 500-meter resistant watch) while staying sturdy. With a case diameter of 43 mm made from stainless steel, along with a scratch-resistant anti-reflective sapphire crystal window, you shouldn’t ever worry that the watch will get damaged from high falls or persistent scratches. There’s nothing specific about this watch that can actually be considered a drawback. If you want to beat the world record for the deepest scuba dive (332 m), or you are a professional diver, or just diving for fun, either way the Victorinox Dive Master 500 might be just the perfect match for your needs. The Luminox Navy SEAL watch is the timepiece that made Luminox famous. In 1993, Nick North, Assistant RDT&E Officer for the Navy SEALs, was sent to a trade show to find a more dependable watch for the night missions and found Luminox, which was a young company at the time. 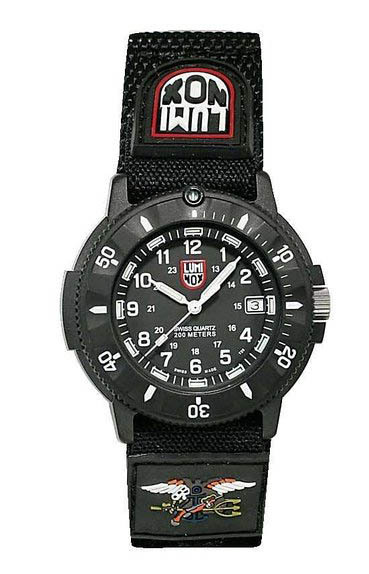 Shortly after that, Luminox became the main watch provider to the Navy SEALs, and it wasn’t long before their watches started to gain popularity with the general public as well. Compared to the other diver watches in this price range, Luminox is one of the lightest of all. Durability and lightweight are its big selling points. The case diameter is 43 mm and is made of hard polyurethane, with a black dial and a date function. The mineral crystal window makes it deal very well with strong shocks. Also, it resists at depths as large as 200 meters (660 feet), not very impressive, but enough for most recreational scuba divers and the larger part of pro divers. The Swiss quartz movement is precise but is not something to make a fuss about. It’s a good classic mechanism that won’t give you deviations over time. The Luminox self-powered illumination (LLT) allows you to view the time at a glance, no regardless of light level. Being able to read the time effortlessly under all circumstances is a must for a dive watch, and Luminox seems to check on this requirement brilliantly. The U.S. Navy SEALs might actually tell you the same. The original rubber band is not the most comfortable out there, but luckily it has a Velcro alternative which is better. The Luminox Men’s 3901 Original Navy SEAL Dive Watch is a perfect match between military feel and ruggedness on the one hand, and the functions a divers watch needs to have on the other hand. The experience the Luminox brand has with diving watches might weigh in the balance when you make a decision if this is the watch for you. If you thought 500-meter water resistance is much, think again. 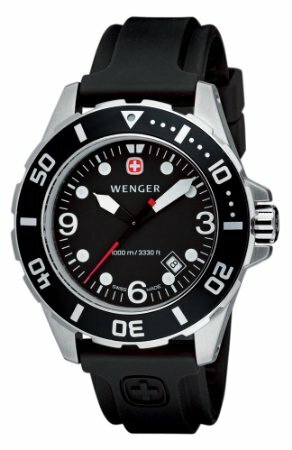 With a huge 1000 meter (3300 feet) resistance – yes, it’s actually that much -, Wenger took it seriously and built a true dive beast. Actually at this kind of depth, you would need an atmospheric diving suit in order for your lungs not to explode. So if you never ever want to worry about your watch’s resistance at huge depths, this is definitely the watch for you. You can’t find a 1000 meter watch anywhere else for under double or triple the price you’d pay for this Wenger. Along with the unbeatable water resistance, the 72233 AquaGraph incorporates everything you would expect from a watch of this magnitude. From a beautifully crafted stainless steel case to a comfortable rubber bracelet, this watch is a deal maker for the moderate budget. The precision is certainly not a problem you would come across while using this watch, the Swiss quartz movement will do the job even if you are really demanding in this matter. The gorgeous 43 mm (1.7mm) brushed stainless steel case with a screw-on case back feels premium and solid, and makes it very easy to change the battery without going to an authorized service. The bezel is unidirectional and has a luminous marker at the zero position. The watch has luminous hands, numerals, and markers. Luminosity in the dark is good. Also, Wenger decided to keep a simple and classic screw down crown, with a pull-push mechanism for time alterations. The rubber band feels very comfortable, but it is not long enough for use with a wetsuit, so consider buying another one if that’s a big thing for you. The huge water resistance, sturdiness, precision, quality of materials and affordable price, all add up into a reliable, beautiful watch, that certainly won’t disappoint whether you are a professional diver, or a diving enthusiast. Obviously, when speaking of the value for the money you’re spending, Seiko ranks up among the top brands, well known for manufacturing high-quality watches at a decent price. Founded in 1881 by Kintaro Hattori, the company perfected over time, now delivering many kinds of watches all over the world, the company’s over a century-long experience speaking for itself. A remarkable fact that few people know is that Seiko was the first company ever to introduce quartz in their watches, and also the first to produce a watch that could withstand 150 meters of water pressure. Also, as a bonus fact, the Seiko Watches were the first to be advertised on television in Japan. At the time, this was a huge thing and was seen as a very rule-breaking attitude from a watch company. The Seiko „Black Monster” Automatic Dive Watch is identical to its brother the „Orange Monster” in terms of specs, the color being the only difference. Its key features such as 200 meters water resistance, astounding luminosity, and premium feel, are just a few of its strong parts that make it shine out from the crowd. As any other automatic watch, the „Black Monster” winds itself with the motion of your wrist, meaning that you won’t be bothered with changing any batteries. The case is made of high-quality stainless steel, that feels surprisingly heavy when compared to its 42 mm diameter, and also due to the fact that Seiko tried its best to include as many top functions as possible. It has a beautiful mix of polished, brushed and machined finishes which all add up to create the special feel of the watch. The movement is given by a 21 jewel Seiko 7S26 running at 21.600 bph (5 ticks per second). The mechanism is known more for its reliability and ruggedness than for its precision. The stainless steel scalloped bezel has its protectors firmly positioned, it is unidirectional as expected on a diver’s watch, which means you won’t be able to accidentally turn the seconds counter backward and run out of air. It will only go one way so in a worst case scenario you’ll come up earlier than intended. As mentioned in the introduction, the luminosity of the watch is by far one of its best features, leaving even watches over 500$ far behind. Due mostly to Seiko’s proprietary Lumibrite technology, but also to the large coated areas on the hour markers and hands, the watch’s indexes will for sure be visible in the dark, as well as in murky water. The notable thing about the band is that it incorporates a cleverly hidden diver’s extension that allows you to wear it over a scuba suit. The 21 jewel Seiko 7S26 mechanism is known as not being the most precise out there (it’s still precise enough for the majority of people), having users reporting up to +/- 15 seconds daily. However, keeping it in a watch winder would solve the problem. 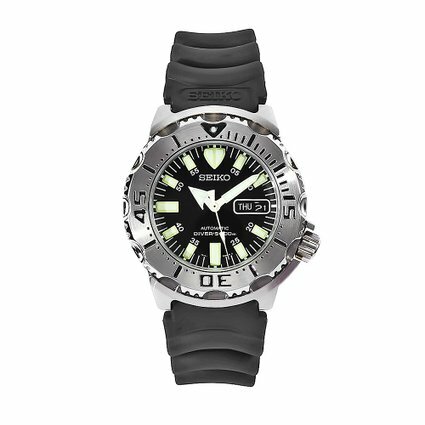 Since the aim of the watch and the company, in general, is to offer as much value for the money as possible, the Seiko „Black Monster” Dive Watch is an ideal compromise between a quality product and a decent price, and it’s up to you if you consider it to be the best diver’s watch around the $300 price tag. I think it comes pretty close. For more price-conscious Seiko diver watches, have a look here. While you will still find tiny inconveniences in either of the watches we reviewed, it is obvious that these days you can get a high-quality diver’s watch with lots of functions for a moderate price. Just a few years ago, you could only find the same features at a $500+ price point. Now it is just a matter of taste and preference, and whether a certain feature or brand feels more appealing to you. You should weigh the pros and cons for every watch in part and decide which one feels like the best dive watch around $300 for you.